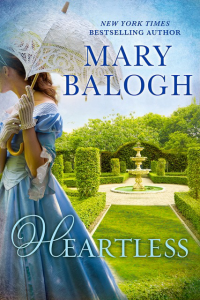 Heartless, first published in 1995, was a new venture for me. 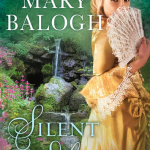 It is a Georgian historical, set during the 18th century, several decades earlier than most of my other books, which are set in the Regency era of the second decade of the 19th century. The slight change of era made a great deal of difference. People dressed, spoke, and behaved differently. Ladies wore large-skirted, hooped dresses and powdered their hair and wore black beauty patches on their faces. Gentlemen wore large-skirted coats and buckled, high-heeled shoes, and powdered wigs. They often wore makeup and sometimes carried fans and snuffboxes. By our standards they may have appeared quite effeminate, but in the best of them there was masculinity to the core. They carried swords at their sides and knew how to use them. Lucas Kendrick, Duke of Harndon, is the ultimate Georgian gentleman. He has lived in Paris for ten years and even there he is known for leading fashion rather than following it. He is also known as a cold and ruthless man, a deadly shot with a gun and equally deadly with his sword. He is also known as a man who can charm any woman to his bed. Luke’s cold heartlessness is self-imposed. Ten years ago, when he was twenty, he was banished from his family home and cut off without a penny after he almost killed his elder brother in a fight. Now both his father and his brother are dead and Luke, very reluctantly, has been persuaded to return to England to sort out some problems on his estate and to deal with some family troubles involving his once-beloved younger brother and sister. He goes to London but refuses to go all the way home. And when his uncle tries to persuade him that his best course is to take a wife and settle to his responsibilities, he is openly hostile to the idea—until he sets eyes upon Lady Anna Marlowe at a London ball one evening. Anna Marlowe has always been devoted to the care of her family. Saving them from certain ruin, however, once drew her into deep, dark trouble, and she sees no way out of it for the rest of her life. She does agree, however, to go to London to stay with her godmother, but only for the sake of her younger sister, who needs to meet society and find an eligible husband. Anna expects to remain out of sight herself. Her godmother has other ideas, however, and first persuades Anna to clothe herself in a manner befitting her rank and suited to London society, and then persuades her to attend a few balls and parties. At her very first ball, Anna sees the gorgeously-clad Duke of Harndon across the ballroom and decides that surely there is no harm in dancing and even flirting with him just this once. This is the opening chapter of the book. Lady Anna Marlowe smiled and watched her younger sister at the other end of the gallery being fitted out for fashionable clothes suitable to be worn in London. Bolts of fabric, mostly silks and shimmering satins, were piled on tables, some of them partly unrolled. There was some excitement about the scene and about the anticipation of seeing the clothes made and worn, she had to admit. That last point hit home. Victor, Anna’s only brother, had recently celebrated his twenty-first birthday. With university days behind him and his title still new to him—he had been the Earl of Royce since Papa’s death a little more than a year ago—he was soon to return home to take up his responsibilities there. And he was newly betrothed. Where did that leave her? Anna wondered. And Agnes and Emily? Suddenly their home did not seem quite home any longer. Not that Victor would turn them out, or Constance for that matter. But one did not like to intrude upon a newly married couple in their own home—especially not in the status of spinster sister. She was a spinster. Anna clasped her hands rather tightly on her lap. But she could not marry. The thought brought with it the familiar shortness of breath and coldness in her head. She fought off the dizziness. “Large hoops look quite ridiculous,” Anna said. Ridiculous, but wondrously feminine and pretty, she thought treacherously. And her godmother had just reminded her that there was no real tie between her and Agnes. Could she be expected to take Agnes to all the social events at which it was to be hoped she would attract a husband? Was not that Anna’s responsibility? And would it not be wonderfully exhilarating to dress fashionably and to go about in society just a few times? Just for a short while? I will return. And of course you will be here when I do so. You will remember, my Anna, that you are mine? Body and soul? The voice was as vivid in her head as if the man who had uttered them stood at her shoulder and spoke the words now. They had been spoken a year ago at Elm Court. A long time ago and a long way away. He would not come back. And even if he did, it would surely do no harm to enjoy herself a little before he did. She was only twenty-five. And really there had been very little enjoyment in her life. Surely just a little… It was not as if she was going to be in search of a husband. after all. She knew very well that she could never marry. Agnes was flushed and bright-eyed and was exclaiming that she could not possibly need all the clothes Madame Delacroix claimed to be the bare essentials for a young lady of quality making her first appearance in society. Anna’s heart went out to her sister. She was eighteen years old and had been in mourning for two years—first for Mama and then for Papa. Even before that Mama had been ill with consumption and Papa had been—well, he had been ill too. And there had been the poverty. There had been very little chance for Agnes to enjoy her youth. Lady Sterne had insisted from the start that she would bear all the expenses of the few months to be spent in London. It would be a dream come true for her, she claimed, to have two young ladies to take about and introduce to society. She had never had children of her own. Anna had brought some money with her—Victor had insisted that she take some from the estate though it would be years before he could expect to make it prosper again. And perhaps he never would if… But Anna refused to pursue the thought. She was not going to think of any of that for a month or two. She was going to give herself a chance to heal a little. She had told her godmother that she would keep a strict account of all that was spent on her and Agnes, that she would consider it a loan to be repaid when she was able. And so, after all, she found herself being taken into the capable hands of Madame Delacroix and measured and poked and prodded and pricked and draped. It seemed that she stood still for hours while discussing with the two older ladies fabrics and trimmings and designs for petticoats, stomachers, open gowns, closed gowns, sack dresses—it was all very dizzying. She was laced into stays far tighter than she was accustomed to and looked down in some embarrassment—and some fascination—at the way they pushed up her breasts, making them seem larger and more feminine. And she was tied into whalebone hoops so wide that she wondered how she would pass through doorways. How wonderful, it was, she thought. To feel young and free. Not that she was either in reality. Youth had passed her by. And as for freedom…well. She felt slightly nauseated for a moment when she remembered just how very much she was not free. If he should come back from America as he had sworn he would… But she was not trying to break free forever. Merely for a couple of months. Surely he would not begrudge her that much time even if he knew about it. How wonderful it would be to feel youthful and free for two whole months. “Pshaw!” said her godmother briskly. His nephew raised his eyebrows. “You would have me appear in society half naked, Theo?” he asked. But his uncle merely laughed and looked him over from head to toe with leisurely appreciation. His amused eyes took in the powdered hair neatly set into two rolls on either side of the head, the long hair caught behind into a black silk bag and tied in a large bow at the nape of his neck—it was his own hair, not a wig—the austerely handsome face with its dusting of powder and blush of rouge and one black patch; the dark-blue silk coat with its full skirts and silver lining and lavish silver embroidery; the tight gray knee breeches and white silk stockings; the silver-buckled shoes with their high red heels. The Duke of Harndon was the very epitome of Parisian splendor. And then, of course, there was the dress sword at his side with its sapphire-jeweled hilt, a weapon with which his grace was said to be more than ordinarily adept. “‘Tis time for old wounds to be healed,” his uncle said, “and the awkwardness of a long and mutual silence to be overcome. Ashley and Doris were too young to be held responsible for anything that happened, and your mother, my sister—well, your mother is as proud as you, lad. And Henrietta…” He shrugged expressively, unable to complete the sentence. “And Henrietta is George’s widow,” Luke said quietly, his fan still. Luke sat down at last, crossing one leg elegantly over the other. He set down his fan and withdrew an enameled, jeweled snuffbox from a pocket. He set a pinch of snuff on the back of one hand and proceeded unhurriedly to sniff it up each nostril before replying. “And yet you came home,” his uncle reminded him. “You will return to Bowden?” his uncle asked casually. The duke inclined his head to acknowledge the hit but made no reply. “There is frequently dissension between brothers when the one is the other’s heir,” Lord Quinn said. “As there was between George and me?” Luke fanned his face slowly. “But it was not because I was his heir, Theo. And until he was four-and-twenty and I twenty, we were the best of friends. I never remember coveting the title despite what must have been said afterward. There was one specific cause of our quarrel. I very near killed him, did I not? One inch lower, the physician said. One inch. I was a poor shot in those days.” There was coldness, almost bitterness in his voice. “This duke is not in search of a life’s partner,” Luke said. “The very thought is enough to make me shudder.” He shuddered rather theatrically to prove his point. “Heaven forbid!” the duke said fervently. He turned back to the library as the door closed behind his uncle. A bride. He had never seriously considered taking one even though he was thirty years old and had unexpectedly been elevated to high rank on the death of his brother two years ago, only three years after the death of their father. At least, he had not considered taking a bride since ten years ago. He did not particularly want to think about that. Marriage was not for him. Marriage meant commitment. It meant belonging to someone and having someone belong to him. It meant children and the ties they would bring. It meant being bound, body and soul. It meant being vulnerable—again. He was not vulnerable now. He had spent ten years—well, nine anyway, if he remembered that for that first year he had whined and pleaded and then staggered into a life of wild, self-pitying debauchery—carefully cultivating an invulnerability. He had amassed a fortune entirely by his own efforts, first by gambling and then by careful investments. He had made himself into the complete Parisian gentleman so that he was not only accepted everywhere but even sought after in the very highest circles. He had learned how to attract the most beautiful and fashionable women and how to make love to them and how to get rid of them when he tired of them. He had acquired expert instruction on the art of swordplay and on the skill of pistol shooting and had made himself deadly with both weapons; he had learned how to be charming in manner but steely of heart. He had learned that love was not to be trusted, even when it was the love of one’s own family—especially then. He had learned neither to expect nor to give love. He knew that he had acquired the reputation of being a ruthless and a heartless man. It was a reputation he coveted. It was how he wanted to be seen by the world. It was how he wanted to be. And was he now to consider taking a wife? Merely because his uncle thought it a good idea? When had he allowed his uncle to make his decisions for him? Actually, he thought, propping himself against the mantel again and staring absently across the room, if he was to answer that question honestly, he must confess that he had frequently taken his uncle’s advice. At Theo’s suggestion he had gone to France and eventually given up the hope of coming home to resume the life he had known—it seemed rather laughable now that he had been intended for the church and that he had wanted the life of a clergyman for himself. It was at his uncle’s suggestion that he had gone to Paris to make a new life for himself. And it was at Theo’s suggestion that he had come home—well, partly home, anyway. He had come to England, to London. He was not sure he would be able to go all the way home to Bowden Abbey. Henrietta was at Bowden. His sister-in-law. George’s widow. If he had a wife, perhaps he would find it more possible to go home. The thought came unbidden. But he did not want a wife. And he did not want to go to Bowden. Except that Theo had reminded him of his responsibilities there, of the people who depended on him even apart from the members of his own family. Devil take them all, he thought. What were they to him? They were his father’s people. George’s people. He had never wanted to be the Duke of Harndon. He had never envied George his position as eldest son. He had been quite content to be merely Lord Lucas Kendrick. Perhaps the Reverend Lord Lucas Kendrick. He smiled ruefully, though the expression was perhaps more sneer than smile. Poor naïve boy. All eager at the age of twenty to enter the church, to marry, and to live happily ever after. Well, he decided, he would force himself to see his mother since she was in town, and Doris and Ashley too. There were apparently problems with his sister and brother, if Theo was to be believed, problems that his mother seemed unable to deal with, problems that he would have to handle. And he would handle them too, by God. But the problems at Bowden would be solved at long distance. He would appoint a new steward, perhaps, and get rid of Colby. Better still, he would summon Colby to London and allow him to speak for himself. He would not marry. He would tell Theo so in no uncertain terms the next time he saw him. One had to be very positive with Theo or else one found oneself willy-nilly doing what the man wanted one to do. Theo really had missed his calling in life. He should have been a diplomat. Luke had returned to England in order to make an appearance there as duke and in order to wait upon his mother and brother and sister while they were in London. He had come in order to assert his authority where it needed to be asserted—and only where there was need. He had come out of a grudging sense of duty—and, yes, perhaps out of some curiosity. But he did not intend to stay. As soon as he was decently able, he would return to Paris where he belonged, where he was happy—as far as a man without a heart could be happy, that was. Actually he did not look for happiness. If one was happy, one could also be unhappy and would be sooner or later. It was altogether more desirable to steer clear of either extreme.